Chemical investigation of Crateva adansonii DC has led to the isolation of aurantiamide acetate, a novel ethyl pyropheophorbide A, purpurin-18 ethyl ester and pyropheophorbide A. Their structures were elucidated using extensive spectral data. 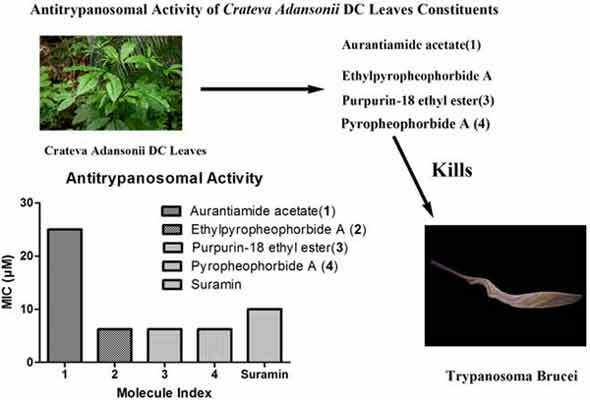 These metabolites were then evaluated for their in vitro bioactivity against the African trypanosome Trypanosoma brucei brucei (S427) blood stream forms. Anti-trypanosomal activity decreased with aurantiamide acetate (MIC 25µ M), while it increased with the pheopytins (MIC 6.25µM), when compared to the standard drug Suramin. Using the Vlife MDS 4.3 - GRIP docking, these phytoconstituents were then tested to identify the proteins targeted and the mode of activity employed. Their affinity towards the receptor sites of trypanothione reductase, riboflavin kinase, rohedsain, glutathione synthetase & sterol-14α-demethylase (CYP51) of Trypanosoma brucei were evaluated according to the resulting docking energies. Anti-trypanosomal activity, aurantiamide acetate, Crateva adansonii DC, ethyl pyropheophorbide A, GRIP docking, purpurin-18 ethyl ester, pyropheophorbide A. Division of Biotechnology, Netaji Subhas Institute of Technology, Azad Hind Fauz Marg, Sector-3, Dwarka-110078, New Delhi, India.